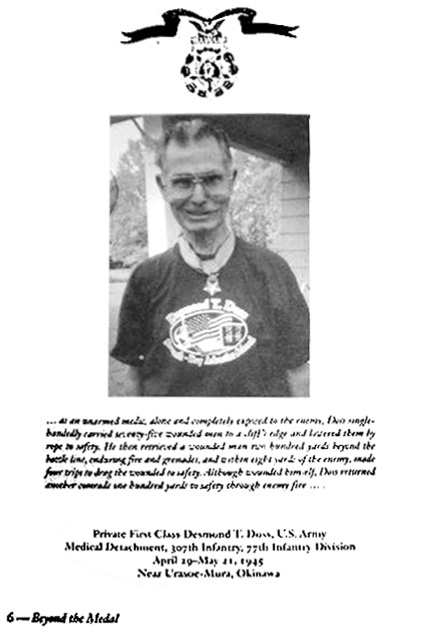 In this picture, which was taken from the book Beyond the Medal, war hero Desmond Doss sports his DTD school t-shirt in unison with his Congressional Medal of Honor. After seeing Hacksaw Ridge at a recent screening, I am left with these thoughts: The battle scenes from the movie are what I would call beautifully horrific. They set the tone for exactly what Desmond experienced those days on Hacksaw Ridge. It gave me even more appreciation for the selfless act Desmond had done for his fellow soldiers—over and over and over again!! It shouldn’t go unnoticed in the film how many times he chose to go back again and again for those same men who had mistreated him during training, even though it was under the most heinous conditions imaginable, and he did it without giving it a thought. Desmond was just like you see him in the documentary The Conscientious Objector. He was very humble when he spoke. Desmond seemed to be the opposite of what one would think a war hero would be. He talked about his actions in a matter of fact way, giving all the glory to God. He never seemed to truly represent what he did with his words because the words didn’t match his small 150-pound frame. For me, the new movie makes the two now match. This story about an unlikely war hero is important to get out on many different levels. First, it is a story about holding true to who you are. In times when most men would have comprised, Desmond never faltered. On another level, as a Christian, it shows what real faith looks like. His faith didn’t waiver in the face of adversity, no matter how heinous that adversity was. We should all live out our faith that way. And Desmond also demonstrated that, if one allows, God can use anyone to do miraculous things for his fellow man. Finally, for humanity, Desmond’s story tells us how we should treat our fellow man, no matter the circumstance. What a world we could live in if we all followed Desmond’s lead!